The most famous button event on Earth is the click event. Let us say, we want to change the message, Hi to Hello, when the button ‘Say Hello’ is clicked. Any idea how we can achieve this with Vue? Mouse events – click, dblclick, mousemove, mouseover etc. Keyboard events – keyup, keydown, keypress etc. Form events – submit, focus, blur etc. So, our task now is to listen when a click event happens on the button, ‘Say Hello’ and change the message text from ‘Hi’ to ‘Hello’. One thing is clear. We have to add our v-on directive to the button element that is where we will be listening to our click event. Cool! But in real applications, we would want to do so much more than just changing the text of a property. The answer to the above brain tugging question is to use methods. Just like the “data” object, our Vue instance has an optional “methods” object where we can define our all methods. Now, within the double quotes of v-on, just mention the name of the method and pass required arguments (if any). Then, define the method in the “methods” object of the Vue instance which will be triggered every time a click event happens. Did you notice the usage of this keyword? In order to refer to the data object’s properties from the HTML, we can use them directly because we hook a particular HTML section to the Vue instance with the ‘el’ keyword. But, inside methods, we have to point to the Vue instance using ‘this’ keyword and then access the properties of the data object. 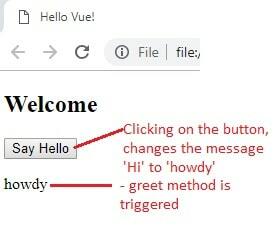 Clicking on the button, ‘Say Hello’ triggered the greet(‘howdy’) method and the code within the method is executed, rendering ‘howdy’ to the webpage. Imagine we have a button named, ‘Add 1’ and a counter whose initial value is zero. Every time the button is clicked, it adds 1 to the existing counter value and prints it to the screen. Let us bring our imagination to reality now. Just use the v-on directive with click as the argument that triggers a method which adds 1 to the counter value. Brain tugging question: What if we want to trigger this method only on the first click and never again? The answer to this question is – event modifiers! These allow us to modify the behavior of the event (just as the name implies). Usage: Following the event name, click in our case, add a dot and specify the name of the modifier to be used. With the event modifier .once, the click event will be triggered only once. This means that the “addOne” method will be called only once incrementing the value of the counter to 1 irrespective of the number of times the button is clicked. The most commonly used modifiers are .stop and .prevent which call the well-known event.stopPropagation() and event.preventDefault() methods. These are the methods that come with the native Event Object. Nothing to do with Vue here. 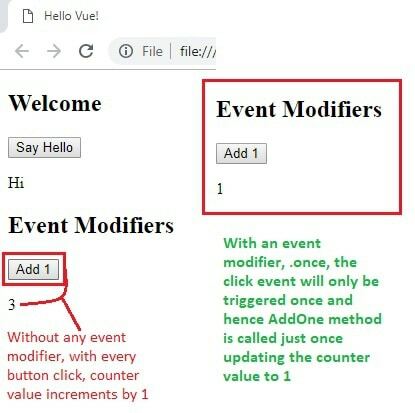 Vue.js just provides an easy way do deal with such common event details with the help of modifiers instead of specifying these event methods (say, event.preventDefault() to cancel the event) explicitly inside the Vue instance’s methods. The .stop modifier would stop the propagation of the event any further, as per the stopPropagation() event method. The .prevent modifier would prevent the default action from occurring, as per the preventDefault() method. Best example for .prevent is to use it with Submit button so that when submit event is triggered, it will not reload the page. Warning: This can be a little mind-bending in the beginning! The order of chaining is very important. Because the code related to each modifier is generated in the same order. Instead, if we change the order of the chained modifiers to v-on:click.prevent.self, all click events will be prevented from happening. 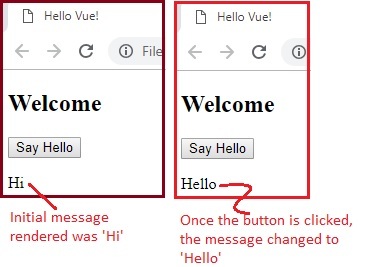 Clicking on both “Open Vue” of <a> and “Click me now” of <p> will not open vuejs.org (or in other words, it is prevented from opening). I know there is a lot to digest today. All the code discussed above along with self-explanatory comments, is available in the GitHub repo. Take your time and I will be back soon to discuss keyboard and other mouse DOM events.